Did She Have A Demon or Was She Demonized? 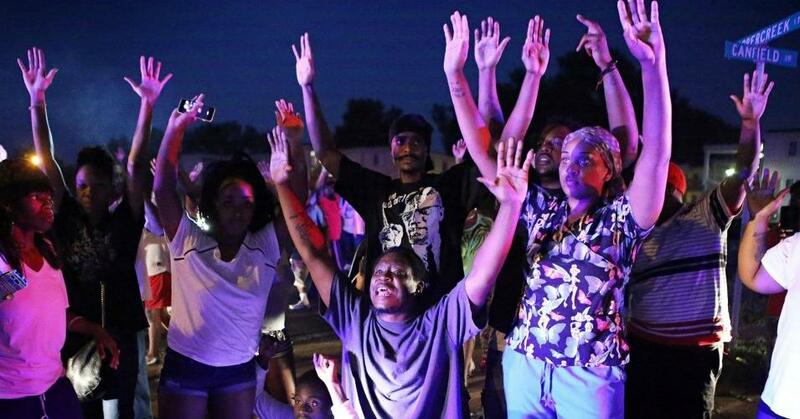 When I look out over the crowds of citizens protesting the murder of Michael Brown in Ferguson Missouri, I see a familiar face raising her hands. She’s the woman in today’s gospel described as a Canaanite woman. Let me break that down for you. For Jesus and his disciples she was otherized as a pagan, unclean by birth, an alien. She was silenced as a woman and she’s usually been quiet, trying to fly under the radar of those watching for her to take one step where she doesn’t belong, waiting for her to make one wrong move. This Canaanite woman is usually quiet but one day everything changes. Now it’s her child who is profiled. Her own daughter is being demonized. And so now this quiet woman begins to shout at the top of her lungs: NO JUSTICE NO PEACE. Actually she’s shouting “Have mercy on me Lord, Son of David; my daughter is tormented by a demon.” First, let’s not over-spiritualize this. I think we can assume that the torment was spiritual and it was personal but it was also public. It had social and political ramifications. It was part of systemic racism towards Canaanites. This woman’s Canaanite daughter was not only tormented by a demon- she was demonized which is an ongoing part of racism because, say, if you are going to shoot an unarmed person with their hands up, you have to dehumanize them first. The reaction to her outburst is swift and comes from the ranks of organized religion, if you consider the first 12 disciples organized. “Send her away, for she keeps shouting after us.” Send her away. We’ve got other things to work on now. Send her away. How dare she raise her voice at us? But what about Jesus? Surely Jesus will listen to this woman. What? This is JESUS comparing this woman’s child to a dog? Joining the systemic dehumanization of God’s children that is used to rationalize their being treated as less than human? How can that possibly be? Well, when we say that God became human, it doesn’t just mean that Jesus had a human body. It means that Jesus grew up and was socialized in a particular time and place and culture, a culture that historically feared and demeaned Canaanites. This Canaanite woman however is not going to stay in her place and allow her child to be demonized. Once again she raises her voice, with a clever come back to Jesus’ comments about her daughter being like a dog. “Yes, Lord, yet even the dogs eat the crumbs that fall from their masters’ table.” Did she just say that? Yes she did and.. what’s more remarkable is that Jesus allows this woman to stretch his mind, to change his mind. This gospel story turns out to be a testimony to the power of listening to voices from the margins that many conveniently ignore and allowing those voices to change us. The Canaanite woman had mentioned crumbs that fall to the dogs from their masters’ table. But I have to say that when I see her standing in the crowd of protesters in Ferguson with her arms raised, I don’t think she’s asking for crumbs any more. When I see her in the ruins of her home in Gaza, I don’t think she’s asking for crumbs any more. When I see her standing before the grave of children dead from Ebola, I don’t think she’s asking for crumbs. When I see her sending her son across the border to avoid being murdered by gangs, I don’t believe she’s asking for crumbs. The time for crumbs is over. And by crumbs I mean, prayers without action. What MLK called, “A high blood pressure of creeds and an anemia of deeds.” Tolerating people instead of accepting them as equals. Multicultual music without authentic multicultural community. Seeking to preserve the peace while avoiding the uncomfortable work of justice. Refusing to recognize the need to repent of our complicity in systems that perpetuate racism and breed injustice. Giving people crumbs from the table instead of a place at the table, even if it means, giving up our place. Offering our leftovers rather than our first fruits. Crumbs. Crumbs won’t cut it. I think it’s really important that right before this story in Matthew’s gospel, we have the story of Jesus feeding the 5000. People that the disciples once again wanted to send away. But Jesus gives the people what they need. An abundant meal. A feast. So much food that there are baskets of leftovers. Because crumbs were not enough. Jesus doesn’t do crumbs. When you and I come forward this morning for holy communion, bringing our own crummy, ragged, imperfect, needy selves, Jesus will not offer us a little crumb of love nor a little crumb of forgiveness. Jesus gives us his body and blood. Jesus lays his life on the line for us. Instead of crumbs from the table, Jesus offers us a place with him at the table. And then sends us out to go and do likewise. To listen, really listen to the cries of those on the margins of our awareness. To talk to someone we’ve be taught to demean and allow our hearts and our minds to be challenged and changed. To set tables of extravagant, equalizing welcome for those who expect nothing more than crumbs and to step aside for those who demand their rightful place at the table where the only Lord and master is Jesus Christ. Jesus doesn’t offer crumbs to the world. God is not in the work of giving out crumbs. God provides the best. And truth be told, when I look out and see you. Each one of you, what I see is a brilliant reminder that God is not in the work of giving out crumbs. God provides the best. For you. In you and through you. And for that, for you, I say thanks be to God!